Combining two hardest material ever found makes this ring truly unique by nature. The horizontal grooves go all the way around the ring with three bezel set diamonds at the top. Comfort fitting on the inside of the ring and brush finish on the outside. The beveled edges are in high polish finish, contrasting the brush finish look on the face of the ring. My husband and I recently celebrated our 25th anniversary. I wanted to get him something beautiful but strong because he works in construction. 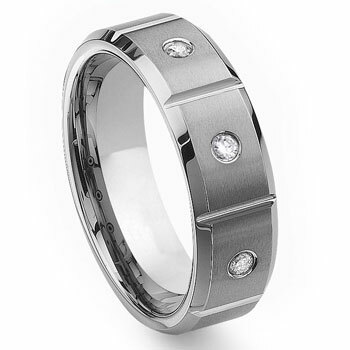 I ordered this band and needed within several days to give ti him right on our anniversary date. It came right on time and when I opened it I was extremely pleased. It is beautiful, heavy and strong. Well worth the reasonable price. My husband loves it. Only one downside...its a size to small. I will return for a size up. I am very happy with the purchase!! Loved this ring!! the groves off the Diamonds really give this ring some flavor!! This ring was a perfect fit, substantial in weight, and the diamonds were amazing accents. The picture does not do this piece justice. If you order this piece, you will NOT be disappointed! The customer service from this organization was amazing, I would do it all over again; Highly recommend. I purchased this ring for my Husband-To-Be wedding band and it is beautiful. He gets compliments all the time and everyone assumes the ring is Platinum and we don't correct them. LOL! Well worth the price and exceeds the price tag in quality. The sizes are great for men my Husband-To-Be wears a size 14.5 and it fits perfect. This is my husband's 3rd ring from Titanium Kay. The very first one I bought for him for our wedding turned out too small, the replacement (half size bigger) was great. Unfortunately, we thought he'd lost it so I wanted to get a new one for him and found this one. Ended up finding the other one in my old purse. So now he has an every-day and a going-out one! :) Love them both! Great quality, great look, and great price (about 3 times cheaper than here in Canada). Definitely recommend Titanium Kay and their products! Good weight much better than in the photo.Very very pleased thank you. This ring looks better in person. The picture does not do it justice. My fiance loved it! It came very quick. I ordered a size 8.5, but needed a size 8. The return policy was quick and painless. Thank you T-Kay! !